The Newman Center - St. Thomas Aquinas Catholic Church on the University of Nebraska-Lincoln campus plans a “NightFever” event Oct. 19 from 8 p.m. to midnight. The doors to the church will be open and students from the adjacent Newman Center will be out on the sidewalks, inviting anybody they meet to come in to light a candle and pray for world peace, an end to violence and their own intentions. Shortly after the 2005 World Youth Day in Cologne, Germany, two German students planned the first-ever Nightfever as a way for the spirit of WYD to go on in daily lives. 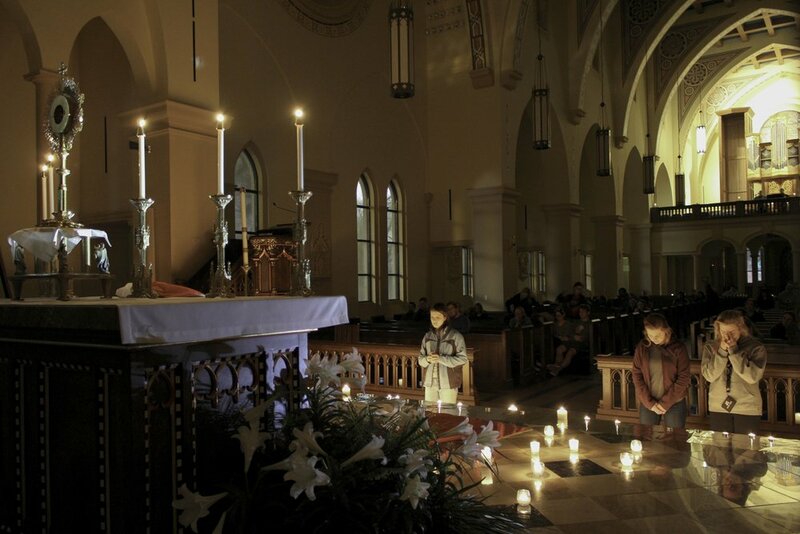 Since 2005, Nightfever has taken place in more than 200 cities around the world and was brought to the Newman Center in Lincoln for the first time in 2015. Since then, it has happened every semester. Luke Miller, the Newman Center’s FOCUS team director, is heading up the outreach efforts for the upcoming Nightfever. “It’s such a great event because it allows students to encounter and live evangelization efforts in a real and practical way,” he said. For four hours during Nightfever, students and FOCUS missionaries will walk the streets surrounding the Newman Center inviting pedestrians into the church to pray. It’s not just about that night, though, Miller explained. Spiritual and practical preparation comes first. Miller’s team of 10 full-time FOCUS missionaries spends time with students the night prior to the event for a street training session. Miller said this helps the students answer the “why” of going to the streets and inviting people in. The training includes the practical side of safely going to the streets, and practicing with mock scenario invitations. “The practice inevitably brings laughter as students see how ineffective their invitation is if it isn’t clear, personal, or derived from an enthusiasm for souls,” Miller said. “This is the perfect opportunity to move past that and realize how important their approach is. “Nightfever is much stronger because it is covered in lots of prayer and practice,” he concluded. The public is invited to join in praying in St. Thomas Aquinas Church Oct. 19 from 8 p.m. to midnight. There will be worship music, prayer teams, confessions, and the chance to light a candle for a personal intention.